For Non Lake Forest Residents there is a fee of $5 for a non resident id card. The Skatepark will be free to use still, just the id card will cost $5. Residents of Lake Forest will receive their id cards for free. The Skull Bowl - was designed by Gary Scott Davis to replicate skatepark pools from the 70's. It is nine feet deep with a five foot shallow end. 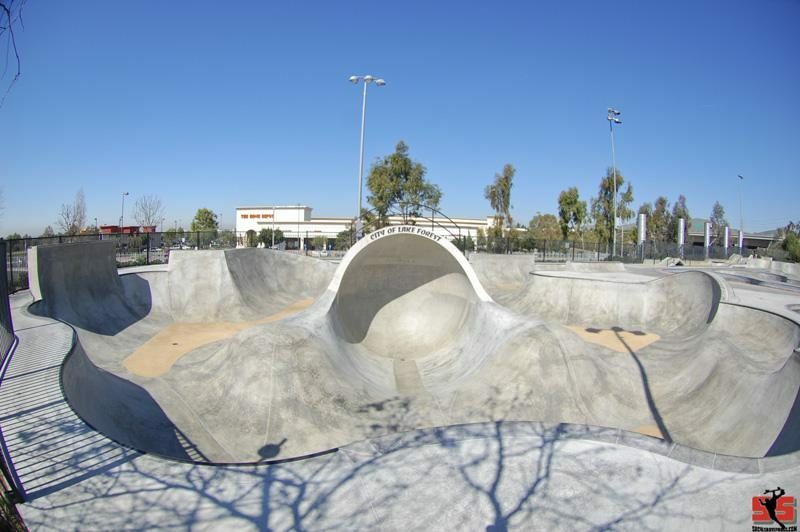 The original coping was replaced with Penrose Pool coping in 2007 and has been home to the World Cup of Skateboarding's final bowl contest held during the Friday before GvR typically takes place. In April of 2011 the Skull Bowl received a facelift with new California State Coping and tiles making it the best it has been to date. The Shark Pool - The newest pool added during the expansion project, this back yard style amoeba pool has 2 death boxes, shallow end stairs, Tedderstone pool coping, and a very flowing layout. It is 4.5ft in the shallow, 6ft in the pockets, and 9.5ft in the deep end. The pool was built using colored concrete to give it the black finish. The Combi Bowl - This bowl is lined with two inch diameter steel coping and is basically a square shallow end with two round deep ends split with a hip. The deep end is eight feet and the shallow end is six feet deep. The Flow Course - A ten foot vert wall with three pump bumps and a central pyramid make up the basics of this area. The shallow end side is five feet deep and the largest pump bump is eight feet tall resembling Darth Vader's head. The Street Course - This area has just about everything you could want in a skatepark street course. Two stair sets including an 11 stair with a 2.5 inch round rail and a 2"x3" square rail perfectly installed and a 5 flat 5 with some large hubbas on each side. There are plenty of boxes including one recently capped in granite thanks to the City of Lake Forest. A smaller 2 foot high square rail also recently had a down rail added as well as two ledges were slant cut on the ends and capped. Everything is of good size and influenced by the obstacles found in many contests today. The Cradle Area - Designed to be a challenge for years to come, the new cradle area is something that is amazing. The cradle is 16ft surrounded by walls from 6ft to 12ft and the 3 ft tractor seat. There is plenty of pool coping, rolled concrete bullnose, and metal coping for all to enjoy. Mini Bowl - The mini bow is 3.5ft deep with a 5ft extension topped with Tedderstone pool coping. New Street Run - Features a 6 stair with rail and bump to rail, peir 7 replica, and a frame roof top hit with square and round rails. There are also always new items being put in and moved about to keep things fresh and entertaining thanks to the City of Lake Forest and the Skatepark Staff. Went here for my birthday last year and can't wait to go back. Just a concrete playground. Every section is top notch. Flawless surface, great coping, endless lines. Wish I lived up here so I could skate it more than once or twice a year. 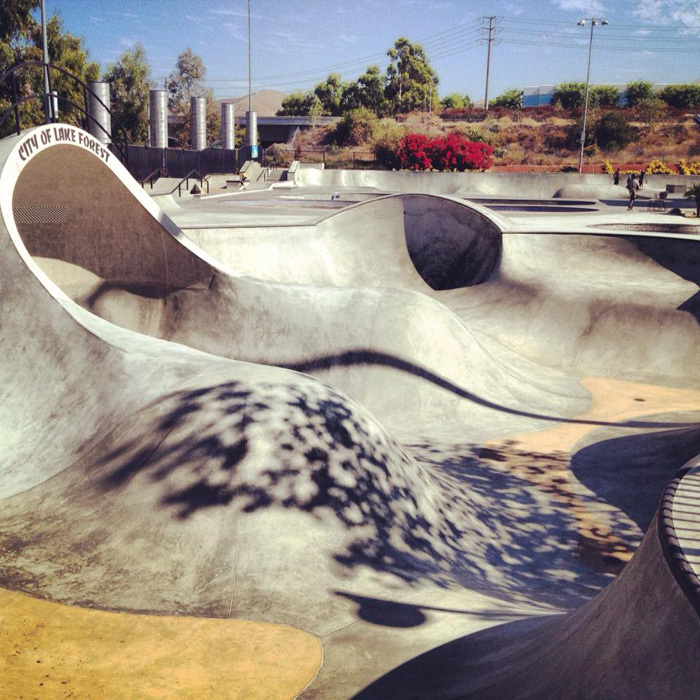 I drive here just to grab some frontside grinds in the skull bowl. The rest of the park is good with lots of terrain, but the skull bowl is magic with smooth fast flow.